Thanks so much to everyone who came along to our Organic Blooms open day on Saturday – it was so nice seeing so many people enjoying our site, our flowers, music from the Swinging Nettles and the gorgeous locally hand-baked and -made goodies from our stallholders. You saw Organic Blooms at its best on a beautiful sunny day, but it isn’t always quite like that. When we are overwhelmed with weeds, cannot source enough organic matter, or lose an entire crop to pests, we are, just sometimes, tempted to question why we’ve chosen to grow organically. 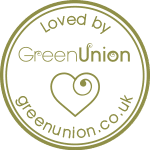 But as the Soil Association’s Organic September comes to a close we’re taking the opportunity to remind ourselves just why it’s so important to us to be organic. Those of you who read the weekly musings of Riverford founder Guy Singh-Watson will know that organic growing is often far from easy, with farmers striving to produce high-quality, reliably-yielding crops in the face of tough market forces, with no boost from artificial fertilisers, no weedkillers and no chemical pest control. And yet organic growing feels instinctively right and can be viewed not as a set of restrictions but as a limitless range of opportunities. Organic growing is an opportunity to develop positive and interesting relationships with other organic producers and retailers as we continually learn more together about soil science, soil and land management, growing techniques, energy, water and waste management and, importantly, about ethical supply chains and the provenance of the products and materials we use in our businesses. Organic growing is also an opportunity to challenge ourselves as we try our best to work with our soils, our local climate and our local organic supply chains. 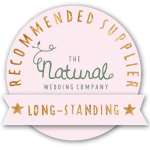 Acceptance that a proportion of what we grow will become food and habitat for local insect life, which in turn benefits local birds and mammals, can ironically become one of the joys of being an organic grower. It’s a privilege and an opportunity to see and connect with healthy and diverse wildlife populations – especially as we have several trainees with extensive knowledge of birds and insects and who take great pleasure and therapeutic benefit from spotting, and being in the midst of, myriad wildlife. This diversity of insect life thriving on organic growing provides us with a practical benefit too. We try not to think of insects and their larvae as pests, but as indicators of a healthy system. Not only are we feeding and encouraging pollinating insects with the old-school open varieties of flower that we largely favour and that are suited to our conditions, but by leaving the insects alone to do their own thing rather than removing a species or two from the equation with pesticides, they tend to find a predatory balance. That’s not to say we don’t curse when the aphids show up, tiny mouth parts drooling as they home in on our succulent sweet peas, but we just have to grit our teeth as we set about removing them by hand, trusting that news of their abundance is what local ladybirds will have quickly heard. 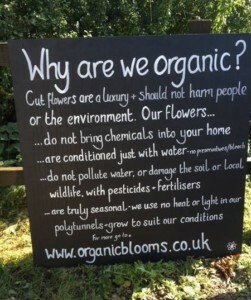 For more about why we, along with all those other dogged organic farmers and growers out there, persist with – and indeed continually seek to improve and develop – our methods, take a look at our new why are we organic?  web page, which includes our Soil Association certificate of registration. This summer my children learned to love wasps. I have never been a wasp-flapper and I’ve tried to teach my girls to resist the urge, but observing a group of wasps ignoring a honey diversion on the end of our garden table, instead carefully cutting impressively large pieces of ham to carry off for their carnivorous offspring, was a turning point. Watching, they were absorbed and understood that the wasps had no interest in attacking them. Noticing that the adults only returned once the ham had been dealt with to feed on the honey themselves, sucking the moisture out of it before tackling the sugary crystals that remained, only increased the girls’ fascination for these maligned creatures. Insects are as fascinating as they are important – why would we not want to share with them?